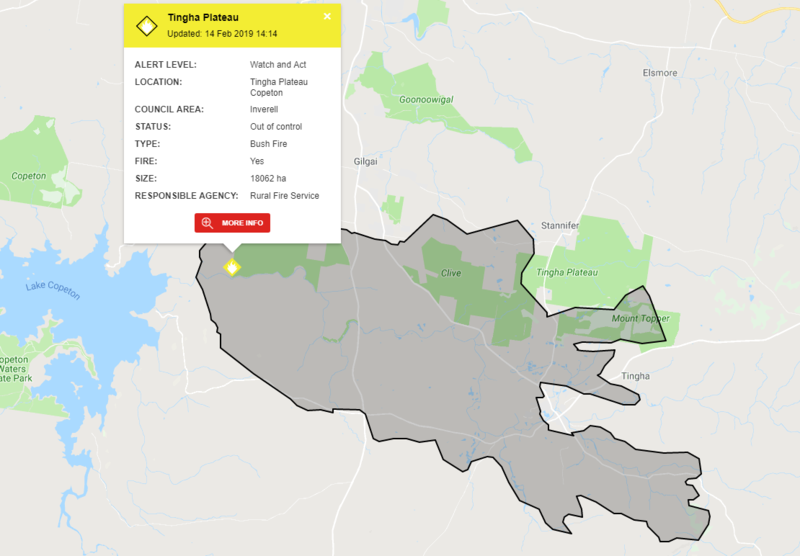 NBN News | FIRE AT TINGHA DOWNGRADED TO "WATCH AND ACT"
Gilgai Firefighters are working on the eastern side of Gilgai in the vicinity of the Inverell Airport and Ponds Creek area. Crews are working to slow the spread of the fire, assisted by aircraft. Old Mill Crews are conducting backburns on the eastern side of Old Mill. This will extend to Old Armidale Road. There will be an increase in fire activity and smoke in the area while these burns are undertaken. There is a reduced threat to properties. Firefighters continue to work with landholders in the area. The fire at Tingha is at Emergency Warning level. Overnight the fire spread in a northerly direction towards Gilgai, Ponds Creek, Old Mill and Stannifer. There is a threat ti lives and properties in the area. Easterly winds this morning may push the fire closer to the Gilgai area but conditions are expected to be more favourable today. Firefighters will be supported by waterbombing aircraft today. Crews are working to protect properties where it is safe to do. Gilgai – The fire has burnt further towards Gilgai. Winds this morning are expected to push the fire closer to this area. If you are in the area and your plan is leave, leave now towards Inverell. Old Mill and Stannifer area – Strong winds have pushed the fire closer to the Old Mill and Stannifer areas. Seek shelter as the fire approaches and protect yourself from the heat of the fire. Tingha township – Fire is burning to the north and south of the township. If you are in the Tingha township, be alert to heavy smoke and embers. If the fire reaches your property or location, seek shelter and protect yourself from the heat of the fire. Guyra Road area, east of Tingha – The fire is burning near properties on Guyra Road and New Valley Road. If you are in the area and the fire reaches your property or location, seek shelter and protect yourself from the heat of the fire. Howell Road area – The fire has impacted on properties around Howell Road and in the area around Grove Road, Kempton Road and Thunderbolts Way, however the threat has now eased. Residents should still continue to monitor conditions.